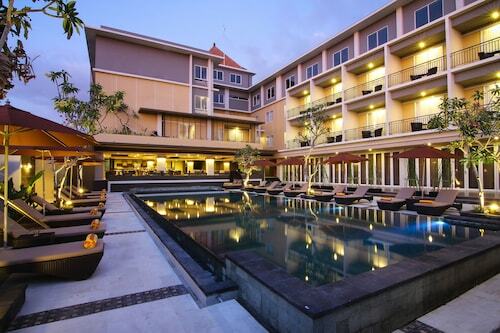 Located in Raya Kuta, this hotel is within 1 mi (2 km) of BIMC Hospital, Kuta Beach, and Beachwalk Shopping Center. Waterbom Bali and Kuta Square are also within 1 mi (2 km). Located in Raya Kuta, this spa hotel is within 2 mi (3 km) of Kuta Beach, Legian Beach, and Mall Bali Galeria. Kuta Square and Kuta Theater are also within 2 mi (3 km). 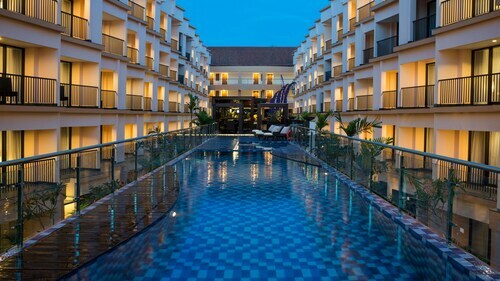 Located in Raya Kuta, this hotel is within 2 mi (3 km) of Kuta Beach, Tuban Beach, and Legian Beach. Eat Street and Seminyak Beach are also within 6 mi (10 km). 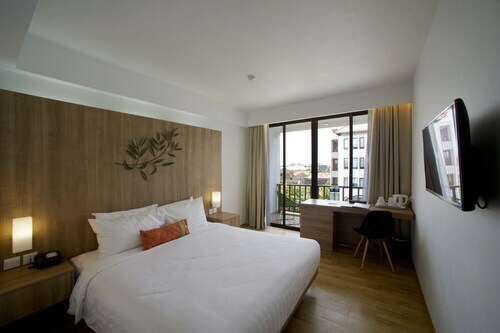 This family-friendly Kuta hotel is located near the airport, within a 15-minute walk of Bali Bombing Memorial, Honorary Consulate of the Netherlands, and Mall Bali Galeria. BIMC Hospital and Kuta Beach are also within 1 mi (2 km). Located in Raya Kuta, this spa hotel is within a 10-minute walk of Kuta Galeria Shopping Arcade and Honorary Consulate of the Netherlands. Carrefour Plaza Kuta and Krisna are also within 15 minutes. Located in Raya Kuta, this hotel is within 1 mi (2 km) of Kuta Galeria Shopping Arcade, Kuta Beach, and Bali Bombing Memorial. Legian Beach and Beachwalk Shopping Center are also within 2 mi (3 km). 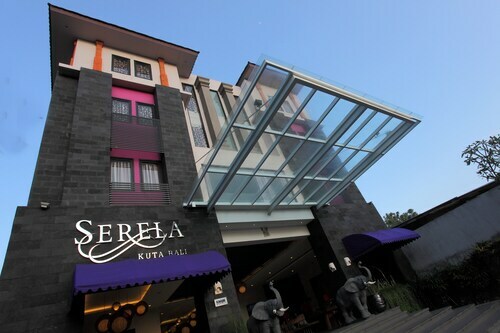 Located in Raya Kuta, this hotel is within 1 mi (2 km) of BIMC Hospital, Kuta Beach, and Kuta Square. Beachwalk Shopping Center and Waterbom Bali are also within 2 mi (3 km). 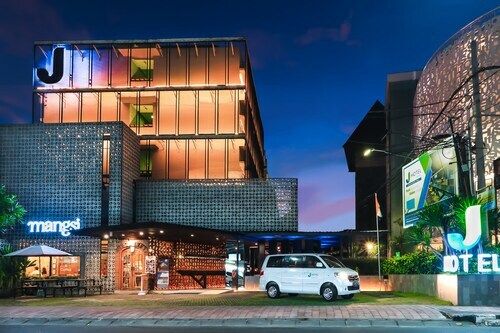 Located in Raya Kuta, this hotel is within a 15-minute walk of Poppies Lane II, Kuta Beach, and Kuta Square. Waterbom Bali and Beachwalk Shopping Center are also within 1 mi (2 km). 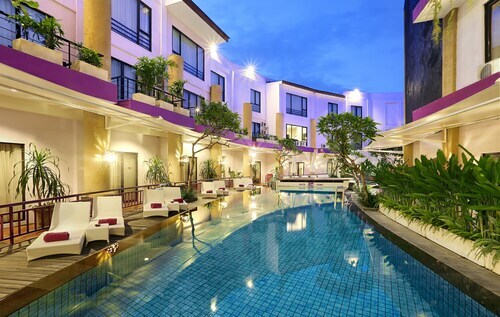 Located in Raya Kuta, this hotel is within 1 mi (2 km) of Circus Waterpark, Kuta Beach, and Waterbom Bali. Kuta Square and Discovery Shopping Mall are also within 1 mi (2 km). This family-friendly Kuta hotel is located near the airport, within a 15-minute walk of Mall Bali Galeria, Kuta Beach, and Kuta Square. Waterbom Bali and Beachwalk Shopping Center are also within 1 mi (2 km). 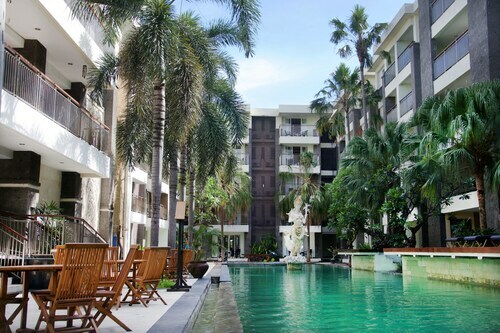 Located in Raya Kuta, this hotel is within 1 mi (2 km) of Kuta Galeria Shopping Arcade and Bali Bombing Memorial. Kuta Beach and Legian Beach are also within 2 mi (3 km). This family-friendly Kuta hotel is located near the beach, within a 15-minute walk of Kuta Beach and Beachwalk Shopping Center. Tuban Beach and Legian Beach are also within 1 mi (2 km). City centre hotels are a great way to stay close to all the action. But to really experience the soul of a city, you need to check out its neighbourhoods. That’s where you’ll meet the friendliest locals, drink at interesting bars and embark on memorable adventures. Book Raya Kuta accommodation through Wotif and get access to the sights, attractions, arts, culture and nightlife the locals love, all wrapped up in the neighbourhood's distinct personality. 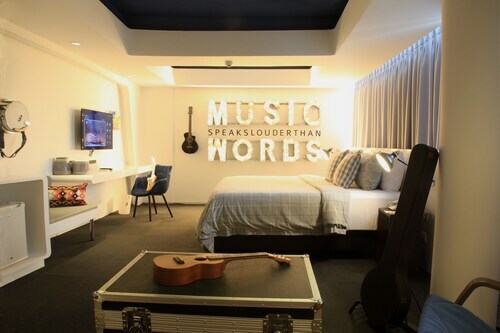 Sleep, eat and play the way the locals do in a hotel that reflects the neighbourhood's flavour. All of our cheap Raya Kuta accommodation deals provide easy access to the sights and sounds of the area. Many of the hotel options are entertainment hot spots in their own right, where guests can eat and drink till their heart’s content. Want to explore the 'hood? Drop the bags off in your room and experience the local haunts ASAP! Got a hankering to see more of the city? No problem—simply reserve a hotel with great transport links. From hotels with their own spas and the best views in town, to boutique properties that radiate charm, we've got the widest selection of characterful hotels. 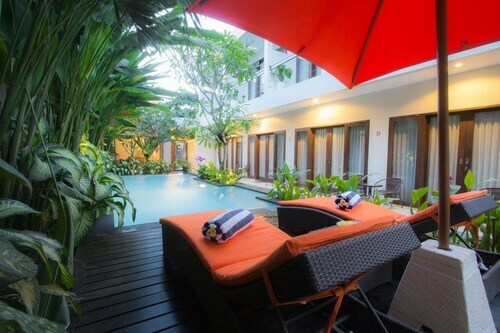 Browse Wotif to find top-rated accommodation in Raya Kuta, from simple to luxe, at prices you can afford. Don’t bother with endless lists of hotels to search through; our easy-to-use search and book system lets you filter by budget, star rating, amenities and more. A few clicks and you're in the door. Now, where did you put that suitcase? How Much is a Hotel Room in Raya Kuta? 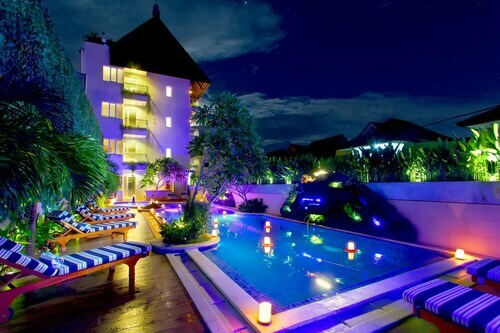 Hotels in Raya Kuta start at AU$35 per night. Prices and availability subject to change. Additional terms may apply. This was by far the worst hotel I’ve ever stayed in! We didn’t get the room I originally booked, so on arrival we had to change rooms. In the second room the fridge was broken which had to be replaced. The safe was completely broken, which also had to be replaced. The bathroom was in utter filth and smelt of urine. The room also had ants, the aircon was leaking and the hotel housekeeping staff failed up restock the toilet paper, I called and asked them to bring up toilet paper 3 times and it still never got done. It was a good thing I had flushable wipes as back up. On the 3rd day there was a massive leak from the ceiling from broken plumbing. We had to fight for 3 hours to get a refund to find a new hotel. We got our refund and checked out and went to a new hotel! About 20 minute walk from the central Kuta area. Although stated in Hotel Amenities that there is a restaurant facility, my view is that it is a cafe not a restaurant. We were not aware that alcohol was not served or permitted in the property until we booked in - (our mistake - we missed the information in the We Should Mention section). The staff however were very polite and friendly and handled any questions we had clearly and efficiently. There were people from many different countries staying at the hotel, and they appeared to handle conversing with them all very easily.